Born in 1912 Bill Bradford and after Eton and RMA Sandhurst served, from 1932, in India and then Sudan before returning to the UK in 1938 to prepare for war. In October 1939 he sailed with his battalion, 1st Black Watch, to France. They were moved into the 51st Highland Division the following spring and by May 1940 were fighting near the Maginot Line. They were then moved to the Somme to defend the new front line. The 51st fought magnificently from 4th - 12th June 1940 - but, each night, had to retreat as the French gave way to their east - on 12th June, exhausted and surrounded, they surrendered at St. Valery-en-Caux on the Picardy coast and were marched off in a north-easterly direction towards Germany. A week later Bradford escaped, changed out of uniform, and walked, first to the coast to try to get a boat to cross the channel and, when that didn't work, headed south. Twice he was thrown out of Spain and in Marseilles he helped set up the famous Pat-Line to get allied soldiers out of France. As part of that effort he moved to Algeria. This was a bad move as Britain had just sunk the French Navy. He was treated very badly by the Vichy Authorities. After seven months in North Africa, using some of his time as a spy, he eventually escaped by sailing a small boat from Algiers to Gibraltar - a 700 mile journey - not bad for someone with hardly any sailing experience. His escape took a year and two days; he travelled nearly 5,000 miles as a fugitive and he escaped once from the Germans and six times from the French. He was awarded MBE for his escape. On returning to the UK he joined the re-formed 51st Highland Division as a Brigade Major, they sailed to Egypt and fought the entire North African Campaign from El-Alamein to Tunis, then the Sicilian Campaign before returning to the UK in the autumn of 1943. He was awarded MC for his significant part in this long campaign. Bradford was posted to General Staff to help planning for D-Day. He became the Liaison Officer to US General Omar Bradley and held this position until 24th July 1944. So on D-Day he landed at Omaha Beach with the Americans. In July he took command of 5th Bn. Black Watch at Caen in Normandy and led them for the rest of the North European Campaign. Over the next nine months he was wounded twice and won two DSOs, one of these was an immediate award for astonishing bravery and leadership. One of Bradford's junior officers, Lt. Philip Smythe, was the father of Bradford's daughter-in-law, Nicky. Smythe died when Nicky was just one year old so she never knew him. When she arrived at Kincardine for the first time in 1976 Bradford was able to tell he that he knew her father very well indeed. 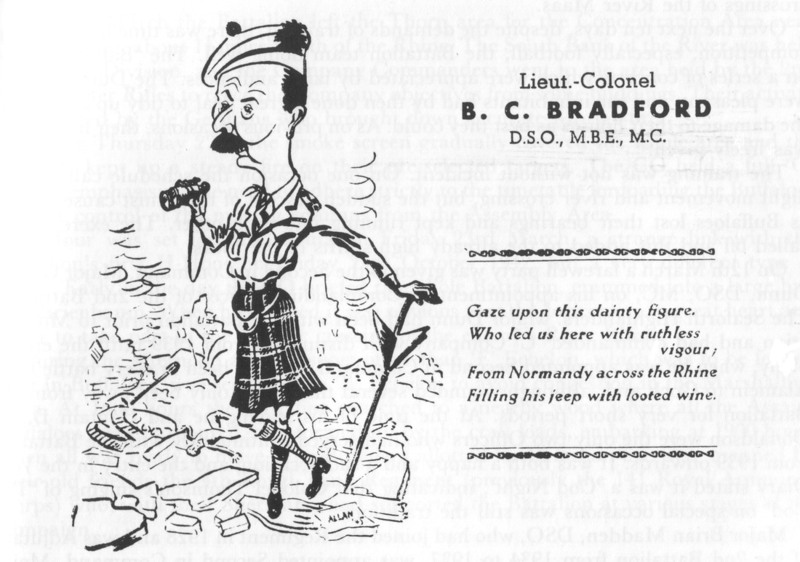 After the war Bradford continued in the Army - commanding 16th Parachute Bn., then 2nd Bn. The Black Watch, and finally 153 Highland Brigade. He retired from the Army in 1959. He married Susan Vaughan-Lee of Kincardine in 1951 and was by then heavily involved in managing this estate. Amongst many other things he organised the planting of 1.25 million trees to replace those cut down for the war effort and blown down by a devastating gale in 1953. In those days one couldn't go out and buy the young trees - so they started with cones from trees, germinated the seed, planted them out, transplanted them two years and finally, after another two years, they were large enough to be planted into the woods. ​Parkinson's Disease was diagnosed in 1972 and he tackled that with his customary bravery - continuing to fish and shoot until 1992 before the disease took its toll. He died in 1996. He worshipped in this church for 45 years.